Chinese Street View in "Peruse-a-rue"
Chinese Street View on "Peruse-a-rue"
The aim of this project is to develop a system that, making use of the Liquid Galaxy capacity to display information over an interactive map obtained from a big data analytics and mining process. Firstly, the data will be gathered from public data APIs and stored in a database to be processed later. This information will be related to historical weather conditions, water and energy reservoirs, earthquakes and other weather related information. Secondly, the data will be analysed under some kind of data analysis algorithm such clustering with K-Means algorithm or Regression Models making use of a Spark Uni-Node System running on the cloud and Python ( pySpark library). The conclusions obtained from this data analysis will be shown on a external interface, such a website running in a server connected to the Liquid Galaxy. This website will offer to the end-user, the possibility to seamlessly display the chosen information into Liquid Galaxy. Then the system will automatically send the corresponding KML files to Liquid Galaxy in order to display this information in a descriptive and visual way, for example percentual polygons, polylines, etc. SAVT will be a software engine to visualize data of crop fields to Liquid Galaxy, allowing you to track his state. This image data, collected by drones, planes or satellites, can be among others : vegetation map, vigor map, nitrogen map, irrigation sectors, dose of fertilizer and variability map.We plan to have access also to data collected by drone, and by different IoT (Internet of Things) platforms, with sensor arrays on the crop field. We'll also use the platform to visualize this data overlaid on the maps and with explanations in almost real time, such as temperature, hygrometry, wind, and others upon availability.The management interface will have the ability to show the analyzed data from a specific client, land or area. Likewise, it will also be possible to collect data from various sources and import images with their coordinates to show them to Liquid Galaxy where each crop field will show a pop-up balloon with all the information about it.Another functionality is the system integration with google assistant using actions SDK to make voice requests and having a conversational UI experience. Mainly the project has the purpose of showing some data in Liquid Galaxy (different options to choose by the user). The presentation will be so visual in the Liquid Galaxy monitors, and the information will be represented in a bubble and different shapes. There will also be the possibility to make a tour according to which is the chosen option. There will be many options, and the user interaction will be so funny and interesting.The point of communication between the user and the application will be necessary to develop a fluid interface. This interface will handle the connection with the API to obtain the data (SPARQL queries), then the treatment of data and classifying them according to the type, and at last sending to the Liquid Galaxy (KML file) to visualize the data in a map point.An important point is to know the data to be treated from the Wikimedia API. The data will have to be processed and save the values that will be useful. There are different use cases and according to these, we will work with some types of data or with others. At the end, the important is that the Liquid Galaxy visualization of the data will be simple and so the user obtains what he has requested. PILT project wants to create a standard to display static and dynamic information over the LG system. We are going to build a system that creates different layers of information in order to display useful representations in the system. The goal will be create a server that handles synchronous and asynchronous information and translates it into KML, moreover we will represent different uses cases like adding integrations with other Liquid Galaxy projects that has to send KML into the system. Main object of the project is the continuity of the FAED code, converting it to DLP, bug stabilizing it and documenting correctly. The aim of the DLP Project is to be a platform which acts as a logistic distribution platform and the visualization of the information relative with this project in the Galaxy Liquid platform. DLP project will generate a massive quantity of information that is very useful to have the opportunity to display it in the Galaxy Liquid technology. Project DLP data that will display Galaxy Liquid: The points where drone will use to land or take off which are drop points, drone hangars. Weather information focused in the weather that can be dangerous for the drone like rain, wind, snow… The current position of the drone and its flying plan. This is a visualization layer and a graphic interface for the LG where the user will see the information related with the FAED project, which is weather data (wind, humidity, etc) and the drones situation, movements, etc in (almost) real time. To create a fluid Android apk controller for the Liquid Galaxy. This user interface will have two main sections: POIs and TOURs selector, Search by on screen keyboard and voice. There will also be a Management Tool protected by a pin. The Chinese street view is a great implement of "Peruse a rue" . But there are still some limitations in the Chinese street view. For example, Baidu.co and Tencent,co cover different street view areas, therefore we can merge Baidu's APIs into this project. And Tencent.co has released new street view APIs, which contain more features. we can add these feature and fix the bugs it brings. I would like to add these features into this project. This Proposal concerns Peruse-A-Rue; Street View for Liquid Galaxy application. The project contains two parts: 1. Addition of a new random panorama feature to Peruse-a-Rue that allows random panoramas within certain limits, similar to www.geoguessr.com and www.mapcrunch.com. 2. Migrating the master display code to run on the touchscreen client, hiding the delay currently seen between the visible master and slave displays. This will also allow a current heading to be shown easily. 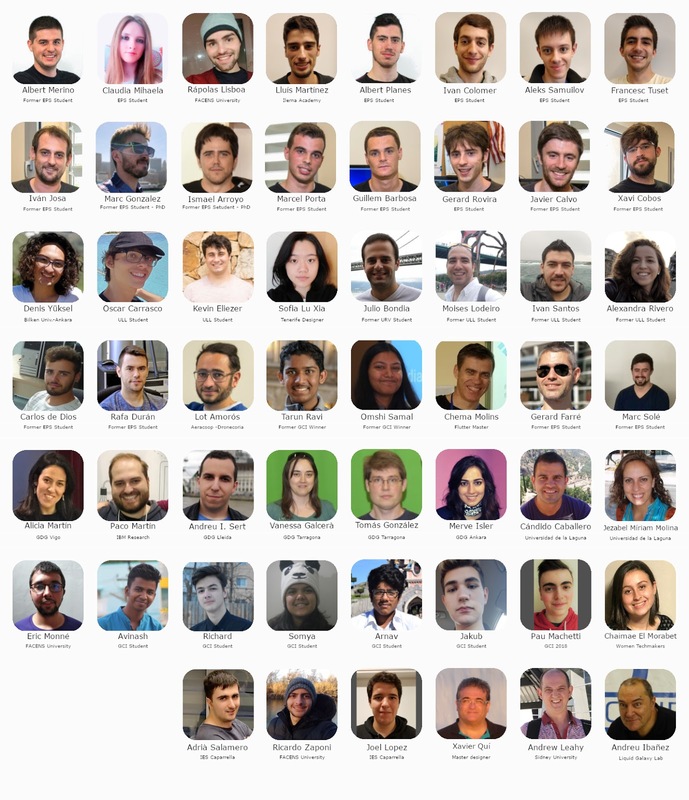 View Your Data is a project ideated jointly by Farré and Andreu Ibáñez, mentor at GSOC Google Liquid Galaxy project, a project with 4 years in the GSOC. The aim of the project is to create a tool that imports data of BigData platforms, and based on them create any presentation data layer to display in the Liquid Galaxy. We want to choose for the GSoC as a pilot the FiWare platform, the most used in Europe, and with many different data, that we pretend to add as layers on Liquid Galaxy. Speech Recognition will be used to interact with the differents Controllers on a IS system and display the information on Liquid Galaxy over Google Earth or new web-browser software peruse-a-rue. The project will include a workbench activities to be tested by other developers and their appropiate documentation. I will do this work using the following technologies: Google Interactive Spaces, Liquid Galaxy, Speech Recognition API (to be determined), Java, Android, HTML5, CSS, JSON, Python, etc. GLSpace is a 3D website that can be dynamically edited. It utilizes WebGL and works only on Firefox for now. My aim is to extend its compatibility on all the browsers and integrate ViewSync feature into it so you can render 3D websites on multiple screens. I think future "websites" should be like "halls", "webpages" should be like "walls of the hall" and "links" should be like "rooms in the hall". It'll replace the way you surf the internet today with a more convenient manner. In the LG LAB, involving conference calls and the LG project is a really good mix and would give a better and realistic way to communicate between people. The program is thought to run on a web browser(WebRTC), this makes it multi platform and much more useful also supports multiple users with LG in the same conference. The idea of this project is to develop a real-time performance benchmarking solution that will help diagnose bottlenecks and configure the SquidHTTP cache for a better performance. The metrics that this solution will take care are: - CPU, Memory, Network utilization and User eXperience Level. Continuing the ClusterGL project from SoC2011 Development of the transparent OpenGL distributed rendering system for Liquid Galaxy hardware. Using Microsoft Kinect, the gesture and voice recognition features will be used to control the Liquid Galaxy navigation around the Google Earth Map to create a more interactive user experience. This will involve using voice to search for locations and get directions to them and using gestures to move the map around and zoom. Currently, the most popular method of controlling Liquid Galaxy setups is through the use of a Space Navigator (produced by 3Dconnexion) and a touchscreen. This project aims to improve Liquid Galaxy’s accessibility by adding Android phones to the list of input devices. Since many people own Android phones already, this project would effectively eliminate the need to purchase additional peripherals in order to control a Liquid Galaxy setup.